The experiment just started as I headed down to the Verizon store in San Francisco around 10 am to get the first handheld device which I will use for the next 9 days, before I change to a new device, use it for 9 days, and do this again and again, for the next 81 days. In this 81-day experiment, I hope to capture and share with you my daily observations relating to usability, features, and service, in order to help new users, and users who are seeking to upgrade their devices, select the device that best fits their needs. On the way, I couldn’t help it but take some pictures of the city--something I might do in the future using the actual devices. Even though they are not relevant to the experiment, I included a few pictures below just to give a feel for the location of the experiment, and the things that caught my attention along the way. As I arrived to the store, it wasn’t too long before one of the customer service reps greeted me (let us say it was Linda) and asked for what I am looking for. Even though I knew that I would like to walk away today with the Treo 700p, as my first device in this experiment, I still asked for Linda’s recommendation. Linda asked me two important questions; first about my purpose of getting the device and second about what kind of computer I am using. Linda proceeded to show me the Treo models, indicating that the Treo 700p would be recommended for someone who is familiar with the Palm OS, and it works well with both Windows computers and Macs. She then pointed out that the Treo 700w would be recommended for Windows users who want to have their office applications and their documents on the go, but not ideal for Macs users. When I asked about the other brands like the BlackBerry(ies) and Motorolla Q—which were close by, I was told that the BlackBerry is ideal for users who are mostly interested in e-mail because it does e-mail very well including on-going e-mail synchronization, and the Motorolla Q, similar to the other Windows Mobile devices, had the Windows advantage for Windows users. Linda also pointed out the Versizon Pocket PC device, which in addition to being a Windows Mobile device, also provided Wi-Fi support. However she pointed out that all these devices provide broadband access, something in the 400 to 700 kbps, and therefore the Wi-Fi support and hotspot access are no longer necessary. Now thinking about connectivity, I wanted to know whether I can use the Treo 700p to connect my laptop to the Internet. The answer was yes at a cost of $15/month. A topic to be explored further in the upcoming days. This didn’t include the cost of the voice and data plans. 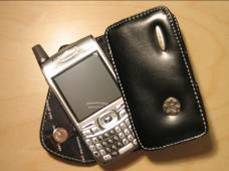 The voice plan which included 450 minutes was $39/month, and the data plan was $40/month, and then adding $10/month for text messaging, and $15/month to allow the Treo 700p to act as a broadband modem for the laptop, which brought the monthly plans before taxes to be about $105/month. And don’t forget the $35 one-time-only activation fee. One thing to note here, is something that Linda mentioned about these Smartphones (the devices there were mentioned above), which is the fact that you cannot get these with devices without committing to a one or two year contract. In other words, you cannot be on a monthly plan that you can easily discontinue. To discontinue the contract, you pay a $175 termination fee. Of course this offsets the discount you got on the device when purchasing the device with the contract. Talking about contracts, you can return the device within 15 days and get your money back. Or you can exchange it with another device also for up to 15 days. However, you can only make one exchange (so I couldn’t just keep exchanging devices every 9 days during the course of this experiment). Another thing to note here, and this relates more to the network than to the device, is that Verizon’s network (CDMA) does not have coverage/support in most international locations. Knowing that I am not planning trips overseas until late September, I will be able to get away with the Treo 700p, and at least the next 9 days. > You need to be quite educated about the devices before you head to the retail stores. While the conversation with Linda was informative, it is not by any means enough to take someone through this sea of information and explore their specific needs to bring about a successful decision making process. > Just like when you purchase a new car, don’t let the price and special offer fool you. Be prepared to spend an additional $200 or more on accessories and $80 to $100 on the monthly plan. > Keep in mind that if you travel, and if you need to stay connected during your travel, the CDMA network may not be your best friend--something that may not come up in the conversation in the retail store—unless you ask for it. > Opening the box—the Treo 700p box, which also means installation, setup, synchronization, and hopefully without the need to call technical support. > Even though I am presenting information about features, plans, and prices, these are only intended to give you some ideas and are only based on one visit to one store, so please take your time to check the facts before you make your decision, and for sure before you make a purchase. > And of course, all 3rd party brands and names are the property of their respective owners. The modem feature sounds very useful and economical. Can you tell me if Can I receive and make calls while using it as a modem? A cool idea indeed. I'm looking at getting a 700p in the next few weeks (my $100 Verizon loyalty credit kicks in next Friday plus they're now offering a $100 rebate online). Will be very interested to watch your results over the next several days. Cool idea for a blog! I'm going to pay close attention to your experiment because it's time for me to enter the 21st Century and get a PDA of some sort. Is PDA still the correct terminology or should I say, "handheld device"? I wonder what they call them in Italy? Answer: Thanks Tamsen! You can call them Smartphones, or handheld devices, or PDA/Phone combo's. PDA (Personal Digial Assistant) refers to the organizer part, usually including the calendar, contact list, task list, etc. Not sure what they call them in Italy. Once you find out, please let me know.